The Royal Canadian Mint has issued two one-kilo coins — one gold and one silver — which feature one of the Canada’s most elusive and admired species of bear, the Spirit Bear. 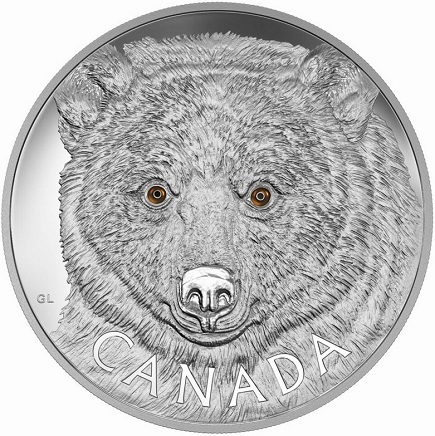 The design for the coins is a beautiful and detailed front-facing depiction of the Spirit Bear’s face, with sparkling eyes enhanced with enamel. Spirit Bears hold a prominent place in the oral traditions of the indigenous peoples of the area, and were named as the official provincial mammal of British Columbia in 2006. The bear’s technical name is Kermode and was named after Francis Kermode, the former director of the Royal British Columbia Museum who researched the animal. The lack of color in the fur of this subspecies of the North American Black Bear is due to a double recessive gene which was been recognized as unique. They are not albinos and are not related to polar bears, whose fur has no color at all. They are also not related to the “blonde” furred brown bears found on the Alaskan islands of Admiralty, Baranof, and Chichagof. Nearly anywhere the North American black bear is found, there is a 1 in 1 million chance of it being born with white fur. In central and northern British Columbia, outside of the coastal islands where the subspecies is concentrated, about 1 in 40 is born with white fur. But on those coastal islands, probably because the subspecies has been so geographically isolated for millennia, one in ten black bears is born with white fur. On Gribbell Island in particular, the odds of a black bear being born with white fur may be as high as 1 in 3. On the coast of British Columbia, where the vast waters of the Pacific meet the Coastal Mountains, the Spirit Bear dwells among thousand-year-old cedars. Many wildlife enthusiasts consider it a rare honor to see a Spirit Bear in their own environment, and while biologists continue to explore how the bear’s genetic trait arose, some hypothesize that the light pelt resulted from a gene abnormality that may have been an attempt to adapt to the glacial environment during the last ice age. Fewer than 400 Kermode bears are estimated to exist in the area that stretches from Southeast Alaska southward to the northern tip of Vancouver Island, with about 120 inhabiting the large Princess and Prince Royal Island. The Kermode’s white fur is thought to offer an advantage in fishing; black-furred bears and Kermode bears catch fish at similar rates at night, but the fish are significantly less fearful of the white-furred bears than their black-furred counterparts during the day, perhaps not registering the Kermodes as predators. The trait thus gives spirit bears a slight edge in the never-ending competition for food. The coin, designed by Canadian artist Glen Loates, features a detailed portrait of the white-furred black bear. The bear’s face dominates the entire reverse field of the coin, its intense eyes taking center stage as it seems to stare directly at the observer. The bear’s dark nose and mouth, dense fur, and brown eyes are given dimensional detail using various engraving and shading techniques. The eyes make an even greater impact with the application of amber-toned enamel irises and black pupils. The text “CANADA” is placed just below the bear’s portrait. 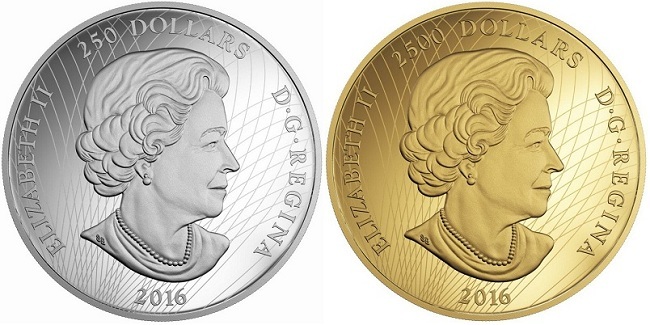 The obverse side on both coins includes the effigy of HM Queen Elizabeth II designed by Susanna Blunt and used on all Canadian circulation coins and many commemorative issues since 2002. The denominations of $250 (silver) or $2,500 (gold) are also seen on the obverses. This is the third coin in the Royal Canadian Mint’s sold-out annual series featuring enamel-enhanced portraits of beloved Canadian animal species. Each coin is encapsulated and presented in a Royal Canadian Mint-branded custom maple wooden box. For more information on these and other coins offered by the Royal Canadian Mint, please visit their Web site. International sales will be dispatched where applicable.